When preparing the kitchen for Pesach Klal Yisrael are very careful to meticulously clean for Pesach and kosher the kitchen. In the process, the pots, pans, plates, silverware, ovens, and other utensils that were used for chametz need to be koshered if they are to be used for Pesach. The rishonim debate whether according to the strict law, the laws of kosher for pesach mimic those of koshering a kitchen from non-kosher or are more lenient. 1 Which materials can be kashered? Which materials can be kashered? The Ashkenazic minhag is not to kasher glass. According to Sephardim, one never needs to kasher glass, as it does not absorb. Rather, one must wash it thoroughly. The same is true for Pyrex and Duralex. even with pots that were used within 24 hours. to ensure that there's sixty times the utensil in the water. one can do hagalah on multiple utensils at the same time. the pot used for hagalah doesn't need to be koshered itself. The minhag is to be strict even when koshering before the fifth hour to only kosher utensils that weren't used within 24 hours. If one is do hagalah after the fourth hour needs to be careful only to kosher a utensil that wasn't used within 24 hours or to have sixty times the utensil in the water. Some add that if is doing hagalah after the sixth hour they need to be careful about both conditions. Some say that it is critical to make sure to have the utensils to be not used within 24 hours before doing hagalah or to have sixty times the utensil in the water even when doing hagalah prior to the fifth hour. 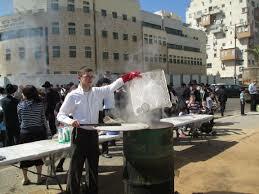 An electric or gas oven should be cleaned from all specks of Chametz and left 24 hours unused. If it has a self-cleaning mode, it should be put on self-clean and that is sufficient. However, if it doesn't have self-clean, many hold that the oven can be heated to the highest temperature it reaches for one hour or two and that is sufficient. Some hold that ovens which don't have a self-clean setting can't be koshered for Pesach. In practice, one should consult one's rabbi. For a detailed discussion of the halachic issues of koshering an oven for Pesach see the Koshering an Oven for Pesach page. However, frying pans used without any oil need libun. According to Sepharadim, dentures need only be cleaned well. Something nullified before Pesach according to Sephardim remains permitted on Pesach. According to Ashkenazim if it was liquid ingredients it remains nullified but if it was a mixture of dry ingredients the nullification is undone when Pesach begins. If one piece of solid Chametz was mixed into two mixed of solid non-Chametz, such as if one Chametz cookie was mixed with two kosher lpesach cookies, one may not eat or benefit from any of the pieces. If a piece of food absorbed a taste of chametz even if that piece has sixty times that amount of chametz it absorbed it is forbidden to eat. If that piece was mixed with two other pieces of non-Chametz food some poskim hold that all of the pieces are permitted since the piece that absorbed chametz is nullified. However, other poskim are strict that there's never nullification even though there is a minuscule absorption of chametz in one of the pieces. If that piece absorbed a taste of chametz more than one in sixty then it is forbidden and forbids a mixture of two kosher pieces. If a liquid mixture absorbed chametz and it was nullified one in sixty it is still forbidden since chametz makes something forbidden in any amount. Even if a bit of that mixture then mixes into another liquid mixture that second mixture is completely forbidden. If a food absorbed a taste of chametz on Pesach and there was sixty times the volume of the chametz in the permitted food, the whole piece is forbidden. If that piece was cooked with other pieces, according to some poskim, if there's sixty times that original piece it wouldn't render them forbidden. According to most other poskim all of them are forbidden. Chametz on the Erev Pesach if it is a solid mixture it is nullified one in two and if it is a liquid mixture it is nullified one in sixty. Chametz that a Jew owned on Pesach is forbidden. If it was mixed with kosher food if it is a solid mixture it is nullified one in two and if it is a liquid mixture it is nullified one in sixty. In a case of great financial loss even a liquid mixture is nullified in a majority. ↑ The Rishonim argue whether the absorption of chametz is considered a permitted absorption and as such it is sufficient to kosher with hagalah, or it is like a forbidden absorption and needs libun if the utensil was used on the fire. Ramban Avoda Zara 76a, Rashba Avoda Zara 76a, Meiri Pesachim 30b all hold that chametz is considered a forbidden absorption. The Ran Pesachim 8b explains that this is the case since the title of chametz is relevant all year even though it is only forbidden on Pesach. Bet Yosef 451:4 explains that this is the opinion of the Rif and Rosh. However, the Rambam (according to Maggid Mishna 5:23), Hagahot Maimoniyot Chametz 5:23:1, Rashi and Raavad cited by Ran Pesachim 30b all hold that chametz is considered a permitted absorption. Shulchan Aruch 451 assumes that it is a forbidden absorption but in 452:1 he seems to contradict himself. See Biur Halacha there. ↑ Rav Shimon Eider in Halachos of Pesach (p. 137) rules that one may not kasher plastic utensils for Pesach based on Igrot Moshe 2:92 who doesn’t allow kashering synthetic rubber since it is a new material that wasn’t discussed by the Rishonim. See however, Chazon Ovadia (p. 151), Minchat Yitzchak 3:67, Chelkat Yaakov YD 45, Tzitz Eliezer 4:6 who allow kashering plastic. ↑ Mishna Brurah 452:13 quotes some achronim who are concerned for the opinions of isura baala. ↑ Rabbi Jachter (Gray Matter vol. 2, p. 221) quoting Rabbi Elazar Teitz, CRC Pesach Guide 2016 (p. 19), Yesodei Yeshurun v. 6 p. 156-160, OU Pesach Guide 2016 p. 24, Halachos of Pesach by Rabbi Ribiat p. 354. ↑ Rav Ovadia Yosef (Chazon Ovadyah pg 73, Sh”t Yechave Daat 2:63), Rav Aharon Kotler (quoted by Rabbi Eider in Halachos of Pesach 1:180), and Rav Soloveitchik (quoted by Gray Matter vol. 2, p. 219) hold that conventional ovens which don't have a self-cleaning setting can be koshered by raising them to the highest temperature that they can reach for an hour or two. Rav Ovadia Yosef explains that according to many rishonim chametz is considered something which is permitted that was absorbed in a utensil that only becomes forbidden over time and as such even items which normally would require libun can suffice with hagalah. Even though Shulchan Aruch O.C. 451:4 holds like the rishonim who hold that chametz is considered like a forbdiden taste all year since on Pesach it will be forbidden and as such libun is necessary on utensils used over the fire, nonetheless, for utensils which can't be koshered any other way and it is difficult not to use the oven all of Pesach, one can rely on the lenient opinion. See Rav Ovadia's responsa for his lengthy explanation. Rabbi Soloveitchik offered another reason to be lenient. Since chametz only got absorbed through a certain temperature, those absorptions can be removed in the same way that they went in, which is certainly less than the maximum temperature that the oven can reach. This seems to be at odds with the Pri Megadim E"A 451:30 who holds that libun needs to be a certain temperature to burn out the forbidden tastes, but it is supported by the Arugot Bosem 119. Igrot Moshe YD 1:60 s.v. aval and Or Letzion 3:10:2 agree with Pri Megadim. CRC Pesach Guide 2016 (p. 19) writes that for non-self cleaning ovens one should heat it to the highest temperature it could reach for one hour after waiting 24 hours. Additionally, the racks and grates should be covered with aluminum foil perforated for air circulation and no food should touch the side bottom or top of the oven on Pesach. ↑ Rav Jachter (Gray Matter vol. 2, p. 218) and OU Pesach Guide 2016 p. 26 quoting Rav Mohe Feinstein. Rav Aharon Felder (Yesodei Yeshurun v. 6 p. 158) writes that even though the oven walls only absorb taste through steam since we're concerned that they absorb taste from something solid spilling on it, it needs libun. Ashkenazim can't follow the majority of uses (Rama 451:6). However, the Or Letzion is concerned even though the absorption is through steam. One proof of the Or Letzion is Shulchan Aruch 451:15 which is a cover of chametz foods on the fire requires libun. One of the reasons of the Tur and Magen Avraham 451:30 because of the steam and the same is relevant to ovens. Minchat Shlomo 2:51 writes that even steam can be koshered with hagalah and the reason that the Shulchan Aruch 451:15 required libun for the cover of chametz is because it is a close cover. ↑ Rabbi Ribiat in Halachos of Pesach p. 354 cites both opinions and advises being strict not to use an oven that doesn't have a self-clean option or to get an oven insert. ↑ The Tur and S”A 451:20 write that the minhag is to pour hot water on the tables and cabinets used for food during the year because sometimes hot liquid chametz spills onto them. The Magen Avraham 451:38 quotes the Maharil who records the minhag to cover the tables and cabinets after this kashering procedure because perhaps some actual chametz was stuck onto the table or cabinet. Kaf HaChaim 451:233 notes that wooden tables which one always eats on with a tablecloth don’t need to be kashered and one should simply remove the actual chametz and wipe down the surface. Rav Mordechai Willig (“Shiur 64 – Pesachim” min 80-82) says that strictly speaking this is also true for countertops on which people don’t put chametz directly. Rav Hershel Schachter (OU Pre-Pesach Webcast 5769, min 11-13) adds that one could either kasher the counters or cover them, but if one isn’t going to put any hot food on the counters on Pesach one could simply clean the counters well. Thus, Rav Moshe Feinstein (quoted by Halachos of Pesach p. 140) maintains that one should not kasher Formica countertops, which are made out of hardened plastic, rather these should be washed and covered. ↑ The Mishna (Avoda Zara 75b) writes that utensils, which absorbed the taste of forbidden food through fire, can be purified through Libun. Tosfot (Chullin 8a s.v. SheLivna) explains that since when chametz is absorbed into the utensils before Pesach the chametz taste was permitted, utensils that usually required Libun, can be kashered with Hagalah. The Ran (Pesachim 8b s.v. Devarim) explains that the Rif considers chametz taste to be a forbidden taste since it has a status of chametz even before Pesach. Although S”A and Rama 451:4 rule stringently, the Mishna Brurah 451:32 notes that in some cases we rely on the lenient opinions. Yalkut Yosef (Moadim p. 600-8, Pesach p. 38) writes that if a microwave is used mostly to reheat and the walls of the microwave don’t reach a temperature of Yad Soledet Bo, one could kasher it by heating up a cup of water with some soap in the microwave for a few minutes. He explains that since most of the time the microwave doesn’t reach Yad Soledet Bo it may not require kashering. Even if it does reach Yad Soledet Bo, heating up water in the microwave until it steams up the microwave is considered Hagalah. He reasons that steam suffices since the taste was only absorbed through steam. He adds several other reasons to be lenient with absorptions through steam such as perhaps the walls don’t absorb through steam, perhaps steam applies only to liquid foods, and perhaps steam absorptions are only d’rabanan altogether. He adds that it is still preferable to cover foods on Pesach in the microwave. Lastly, if the microwave is mostly used to cook or is a commercial microwave that is used very frequently and the walls usually reach Yad Soledet Bo, it shouldn’t be used on Pesach. Rav Moshe Feinstein (quoted by Halachos of Pesach p. 182) agreed that a microwave can be kashered with steam just as it absorbed through steam. Rav Mordechai Willig (“Shiur 64 – Pesachim” min 66-8) agrees if the walls are metal the microwave can be kashered with steam, but if the walls are plastic it shouldn’t be kashered. Rav Hershel Schachter (“Kashering the Kitchen for Pesach” min 10-13) said that if the walls are plastic one could kasher it with steam as long as one covers one’s food on Pesach because it is improbable that forbidden taste is transferred in the air. Similarly, Rav Shimon Eider (Halachos of Pesach p. 182) writes if the walls are plastic one may cover the interior completely and cook in it when the food is covered. ↑ Rav Hershel Schachter (“Kashering the Kitchen for Pesach” min 13-15) said that dishwashers which have a plastic or porcelain walls can not be kashered for Pesach, however, the stainless steel ones can kashered but one must be sure to remove all the particles of chametz stuck in the drain. Halachos of Pesach (p. 175) agrees. See, however, Yalkut Yosef (451:11) who writes that dishwashers can be kashered by cleaning it well and running an empty cycle with soap. ↑ Shulchan Aruch Y.D. 121:4 writes that a frying pan can be koshered with hagalah for Pesach. He repeats this in 451:11. Also, Shach YD 121:8 is lenient to allow hagalah for a frying pan for Pesach and cites the Rama Mpano 96 to support this. Although in YD the Rama doesn't comment, in O.C. 451:11 he quote some rishonim who require libun. He concludes that there's a minhag to do libun but the strict halacha is that hagalah is enough. Biur Halacha 451:11 s.v. muteret defends the position of the majority of rishonim that hagalah is sufficient and concludes that after the fact certainly hagalah works. The Rosh Pesachim 3:7 quotes a dispute between the Raavan and his grandson the Ravyah whether a frying pan needs hagalah or libun. The Ravyah held hagalah since it is used with oil and quotes the Tosefta Avoda Zara 9:2 to this effect. The Rosh, Mordechai Pesachim 577, Hagahot Maimoniyot 5:23:1, and Tur 451:11 accept the Ravyah. Rashba Torat Habayit 35a held like the Raavan that libun is necessary. ↑ Sh"t Ran 59 and Raavad in Tamim Deyim 36 write that chametz is nullified before Pesach and remained nullified. Their proof that something permitted can be nullified and stay nullified is the Mishna Kelayim 9:1. Rabbi Akiva Eiger 1:38 and Pri Chadash 447 asks that it isn't a proof is kilayim is always a prohibition as opposed to chametz. Chida 447 quotes someone who answers that on erev pesach it becomes nullified. However, Yalkut Yosef Moadim sh"t siman 2 and Yabia Omer O.C. 2:23 write that perhaps the opinion of the Rambam is that there's chozer vneer with chametz on Pesach since he holds chametz on erev pesach isn't nullified. ↑ The Shulchan Aruch OC 447:9 quotes a dispute whether we say that for solid items there is nullification for chametz. The primary opinion is strict. ↑ The Levush YD 92 writes that if a piece of food absorbed a taste of chametz and was mixed with non-chametz foods it is nullified one in two. However, the Taz YD 92:16 argues that since there's no nullification of solid items with chametz (Shulchan Aruch 447:9) the same is true with pieces that absorb the taste of chametz. Nekudat Hakesef answers that Shulchan Aruch was only strict not to have nullification if the piece of chametz was real chametz but not if it just absorbed a taste of chametz that would have been nullified if not for the fact that it is chametz. Mishna Brurah 447:93 cites this dispute and seems to conclude that we're strict. ↑ Taz YD 92:16 explains that even though we generally don't have two mixtures made forbidden in any amount (תרי משהוין לא אמרינן) for liquid mixtures even the second one is forbidden since part of the first mixture is mixed into the second one. Nekudat Hakesef agrees. Mishna Brurah 467:38 codifies this. ↑ Taz 92:16 is lenient since the first piece was only forbidden in a minuscule amount it wouldn't render the cooked mixture forbidden (תרי משהוין לא אמרינן). Dirshu quotes two reasons for the Taz. Either the minuscule amount in the first piece physically can't come out (Rabbi Akiva Eiger 92:3, Pri Megadim YD 92:16) or there's halachically not enough strength in a minuscule amount to forbid the second mixture (Yad Yehuda 92:17, Chazon Ish 34:1). Shach in Nenukdat Hakesef YD 92 argues. Birkei Yosef 447:1 and Mekor Chaim 447:17 are strict. ↑ Shulchan Aruch 447:2, Mishna Brurah 447:93. However, Shach YD 92 in Nekudat Hakesef argues that chametz on Erev Pesach isn't nullified at all since it is a dvar sheyesh lo matirin like the Rambam. ↑ Mishna Brurah 447:105 based on the Magen Avraham. Interestingly see the Shach in Nekudat Hakesef YD 92 who assumes that chametz after Pesach isn't nullified at all.